Welcome to the From The Heart Stamps April Blog Hop. Our theme this month is ....I'm no spring chicken! if not why don’t you start on the From The Heart Stamps Blog so you don’t miss anything. This also is my sample for this weeks sketch challenge. and I new I had a straight loopy border die cut from The Cat's Pajamas. by cutting little notches in the bottom. Easy peasy! Glossy Accents on the lenses. on the Birthday Candle Birdbrain set. Now head over to Imke's Blog. and see what she has created. As you hop along, leave a comment on each blog. on each blog to win one image of your choice. and the winners will be posted on Wednesday April 13th. The border made it more interesting! Whoa! Way to rock the sketch...I love your tip for the border...will have to try that.... Well done, teamie! SO clever with your loopy stitch to make it bendy....love your coloring! Wonderful card! Thank you for showing how you got the loppy border! Such a fab card, really makes me smile. So cute. Love how you made that border. Thanks for showing us how. I love your card, great idea with the loops. Clever idea to use a straight punch on a curve ... now you've got me wondering if I can do this with ALL my straight punches! Love that Spectacular Birdbrain too. Fabulous card Doni...one of my favorite Birdbrain images! This is adorable, Doni. Great take on this week's sketch. Very cool. Love how you did the loops on the sketch. Such a fun card. Awesome card and what a great idea for making the border around the circle. Nice take on the sketch. Love the sentiment too! Perfect, fun card for the hop. 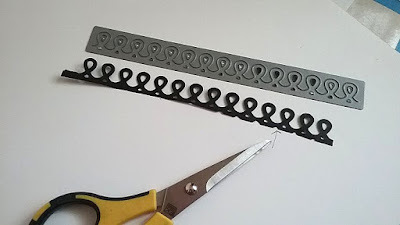 Great tip to make that curved border too. Such a cool card, love it! What a great card Doni! Love the colors and that border is perfect! Wow! So cool how you made that border work for the sketch! FUN Card, Doni and thanks for the little tutorial about curving the border die cut. Great idea. Beautiful card, I love the fun image. Oh I was wondering if I could that with a border punch! thanks for the info. Love that digi! 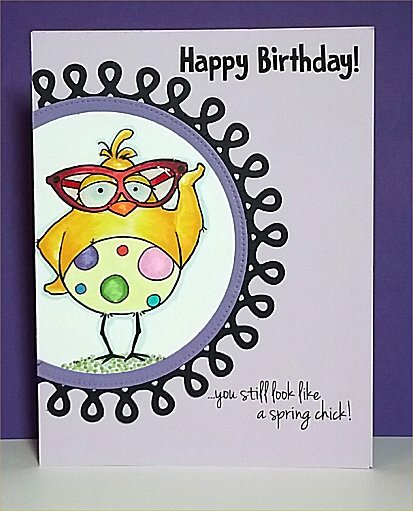 Fabulous card, love this image and your wonderful coloring! oh, she's too fun with her big glasses! Cute! You are brilliant! I have this border and wanted to use it, but was just too dim...Your card is so Spectacular! Doni is such a fabulous card!! Love the tip/trick for getting the diets to curve! Great way to stretch the use of the dies, that's for sure!! I love this image! What a great tip for using that die the way you did! Thank you!